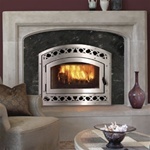 We carry zero clearance fireplaces, fireplace inserts, or full masonry fireplaces. Not sure which kind of fireplace your looking for? Call one of our friendly and knowledgeable sales representatives, they will be happy to assist you with all of your fireplace needs. We can also assist you with planning the chimney system for your installation and offer great discounts on package deals.